Raqqah, Syria, April 8, 2018 — To say that the world is furious at the Syrian government and its allies is an understatement. A recent chemical weapon attack by Syrian jets and a barrel-bombing helicopter near Damascus has killed scores of civilians this weekend. Eye witness accounts suggest that a Syrian government helicopter dropped a barrel bomb into the rear area of the fighting where civilians were hiding in basement shelters. In the Syrian Civil War since 2011, 161 documented chemical attacks plus some 130 unverified attacks have led to at least 1,490 deaths and 14,580 injuries from chemical exposure according to the Syrian American Medical Society. The European Union has just issued a statement in which it says that reports from Douma, under the siege and bombardment by regime forces and its allies, indicate that a high number of civilians were killed Saturday evening, including families who perished in the shelters they were hiding in. The evidence points towards yet another chemical attack by the Syrian regime. Almost a year to the day of the horrific attacks in Khan Sheikhoun, chemical weapons continue to be used on civilians. The European Union condemns in the strongest terms the use of chemical weapons and calls for an immediate response by the international community. In July 2017 and March 2018 the EU imposed additional restrictive measures on high level officials and scientists responsible for the development and the use of chemical weapons in Syria. It is highly regrettable that Russia vetoed the renewal of the mandate of the Joint Investigative Mechanism in November 2017 and the EU calls upon the UN Security Council to rapidly re-establish this mechanism to identify perpetrators of chemical attacks. Accountability is crucial. We call on the supporters of the regime, Russia and Iran, to use their influence to prevent any further attack and ensure the cessation of hostilities and de-escalation of violence as per UNSC Resolution 2401. The protection of civilians must remain an absolute priority. There is no doubt and no need for further discussion about if it happened or not–what matters is putting an end to the use of chemical weapons in Syria. Volunteer medical worker administers Bronchial Dilation to toddler after flushing upper respiratory and face with water and saline. Over six dozen civilians killed. About three dozen children and adults injured by chemical attack and bombing on civilians by Syrian Air Force in the eastern suburbs of Damascus. Medical workers in and around Douma report treating families for severe respiratory ailments consistent with their experience in treating chemical weapon survivors. Erdogan’s top aide Ibrahim Kalin said Saturday’s “chemical attacks” claimed the lives of at least 70 civilians. He said such attacks violated international law and called on the international community, “particularly countries with leverage over the Syrian regime,” to act. Syrian violation of global chemical weapons restrictions are confirmed in numerous ways. Repeatedly the Syrian Air Force has launched chemical weapon missiles at both combatants and civilians. In 2015 the Islamic State was able to steal small amounts of Syrian chemical weapons when it controlled the Syrian city of Palmyra from May 2015 until March 2016 then later again in December 2016. What was most important about these discoveries is that at the time, Syria had declared to the world that all such weapons had been destroyed. In Mosul Iraq ISIS poisoned test subjects with hexamine and other chemicals used in warfare. These came from Assad’s stockpile and labs in Palmyra, a city which both ISIS and Syrian forces fought over ferociously with grave losses to both sides in two significant sieges, one in early May 2015 and another in December 2016. In the latter siege of Palmyra, Syria used nerve gas attacks against the Islamic State fighters. In Palmyra, ISIS discovered mustard agent, chlorine, tabun, sarin and various VX-series CW-variants. Daesh was however ineffective in weaponizing a deliverable of the more advanced CW-WMD agents. The Daesh war minister at that time (Tarkhan Batirashvili known by his nom de guerre Abu Omar al-Shishani ) preferred the lowest technology warfare solutions and had ISIS loyalists arm jury-rigged (technicals) automotive armoured-contraptions with barrels of chlorine and made crude mortar and artillery shells of mustard agent. Published: Mon, 09 Apr 2018 22:27:14— by Melissa Hemingway (feminine-perspective.org staff writer) Military retaliation against Damascus only hurts more women & children. Making the institutions of peace and humanitarianism work is the only way ahead. Syria’s despicable dictator Bashar al-Assad, his brutal confreres, and Russia’s … Read →Assad Won Syria Civil War. Only Humanity is Needed. Not U.S. Bombs. Ethics & Truth Fail in Syria on Two Men of bad Character. 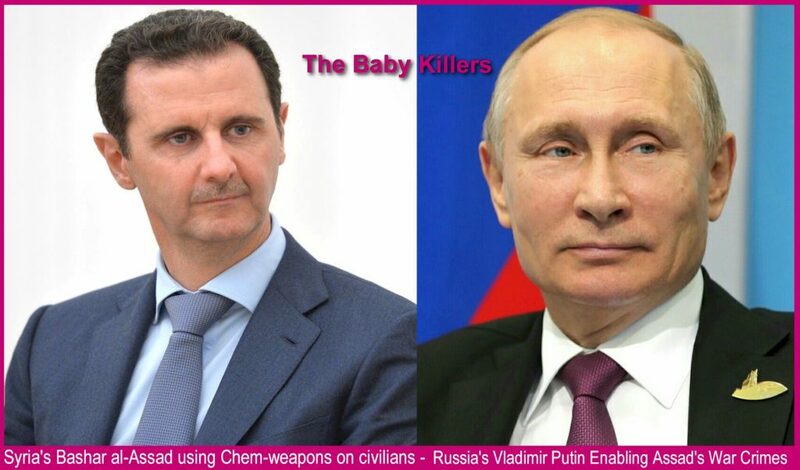 Published: Sun, 08 Apr 2018 21:44:44Once Again Syria’s Assad Kills Civilians Near Damascus with Chemical Weapons as Russia’s Putin Provides Air and Ground Support Raqqah, Syria, April 8, 2018 — To say that the world is furious at the Syrian government and its allies is … Read →Ethics & Truth Fail in Syria on Two Men of bad Character.